The GUKPT Goliath festival returns in just 6 weeks time and we are once again running our £25,000 guaranteed tournament on Saturday 28th July. 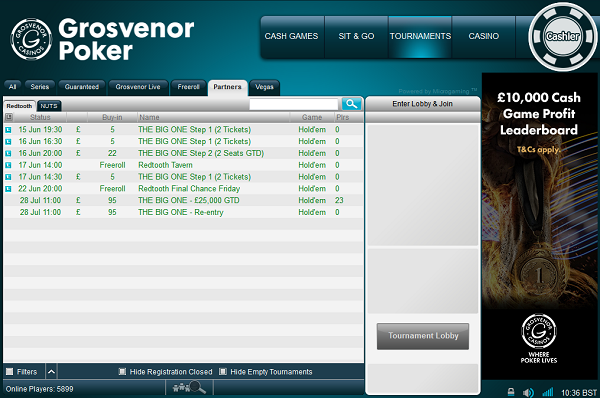 Online qualifiers are running and have been for a while and you can win your £25k seat for just £5 on Grosvenor Poker. You can find our online qualifiers via the ‘Tournaments’ > ‘Partners’ > ‘Redtooth’ tab in the Grosvenor Poker software. Our £5 online satellites, giving out £22 tickets, run at 7:00pm Friday, 4:30pm Saturday and 2:30pm Sunday. Our £22 online satellite, giving out £95 tickets, runs at 8:00pm Saturday.